To serve lamb on Easter Sunday is an ancient custom. Although this recipe is not specifically intended for an Easter meal, this pie will be a great succes when served on the occasion. With a salad or mixed spring vegetables this is an excellent festive course. 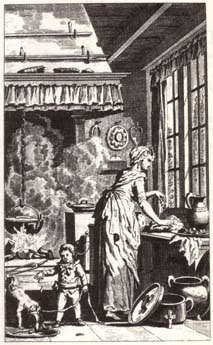 The recipe is taken from a cook book dating from the late eighteenth century, the Nieuwe Vaderlandsche Kookkunst (New National Art of Cooking, see bibliography). According to the prologue this cook book is not just meant to “flatter and gratify the delicate tongue” (“de kiesche tong te behaagen en te streelen”), but it also serves to “help those who serve in the kitchen, and nothwithstanding have not acquired any high degree of expertise in the main cause, and enable them to carry the approval of all whom they are obliged to serve food to” (“die geenen welke zig aan de dienstbaarheid van de Keuken verbonden, en desniettegenstaande geen hoogen graad van ervarenis in de hoofdzaak […] hebben verkreegen, te gemoet te komen, en in staat te stellen om de goedkeuring van allen voor welken zy verpligt zijn aanterechten, weg te draagen”). The cook book has been written by “two housekeepers who are very experienced in this profession” (“twee in dit vak zeer ervarene huishoudsters”). The book is divided in 23 chapters, on soup, meat, game, poultry, the curing and salting of meat and the production of sausages and black pudding, pasties, stewed fruits and vegetables, sallads, farinacious foods like porridge and noodles, fresh and salt water fish, sweet and savoury pastries, and the conserving of fruits. In this recipe the pie is being baked in a pan which was placed over the fire or in an oven. When the pan was placed over the fire it would have been covered with a lid with upstanding sides on which embers could be placed to ensure heat coming from above as well as below. In Dutch this kind of pan is called taartenpan, in English it is called a Dutch oven. (Witteveen pp.19/20). The crust of the pasty is made of dough. The writers of the Nieuwe Vaderlandsche Kookkunst do not provide a recipe for the dough, other than that it was made of flour and boiling water. The crust was not meant to be eaten, it was nothing more than the container of the stuffing. But, because nowadays we like a crunchy crust, you can use any pastry you fancy. On this pageyou find several recipes for dough. From the Nieuwe Vaderlandsche Kookkunst (New National Art of Cooking, 1797, see bibliography). Other recipes from this cookbook on Coquinaria: Quince Jelly, Salsify with parsley and Custard with ratafia. Hiertoe neemt men lams-cotteletten, klopt dezelven, even als men doet wanneer menze opden rooster wil braaden; wenteltze voords in meel, vermengd met gestoten beschuit en zout, baktze alsdan in boter bruin, laatze koud worden, rolt het deeg uit, en legt het in een pan, doe ‘er een forse in gelyk bij den DUIVEN-TOERT (Bladz.113) is geleerd te maaken; leg vervolgends de cotteleten daarop, met een weinig moreljes; doe weder ook van het deeg daar overheen, maak het digt toe, en laatze gaar bakken: maak voords een saus van meel, jeu, fyn gehakte chalotten, kruidnagelen, peper, zout, en citroensap naar den smaak, laat dit alles zamen kooken, tot het gebonden is; snyd het deksel van de pasty weder los, doe de jeu voornoemd daarin, en recht aan. For this one takes lamb chops, beat them lightly just as when one wants to roast them on the grid; then roll them through flour, mixed with ground rusk and salt. Then fry them brown in butter, let them cool, roll out the dough, and lay it in a pan. Put a stuffing in it as has been instructed at the making of the pigeon pie (page 113). Then put the chops there on with some morels. Again put the dough over this, close [the pie], and let it bake. Then make a sauce with flour, gravy, finely chopped shallots, cloves, pepper, salt, and lemon juice to taste. Let all this boil together until it has thickened. Cut the cover of the pasty loose, put in the afore mentioned gravy (the sauce), and serve it forth. […] neem dan anderhalf pond kalfsgehakt, doorkneed met gestoten beschuit, nooten-muscaat, peper, zout, gehakte pietercelie, en drie eiëren; doe dit op het deeg in de pan, leg daarop het gestoofde, en doe ‘er het deeg overheen; maak vervolgends de toert digt toe, en laat haar in een pan of oven gaar bakken […]. 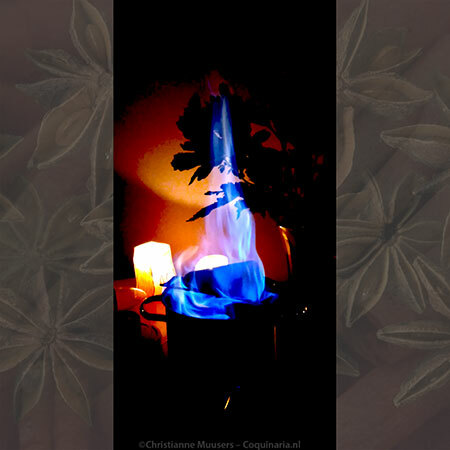 […] neem voords tarwemeel en brand het af met kokend water, maak er vervolgends uw pasty van […]. Please use home made stock for this recipe, not stock cubes. 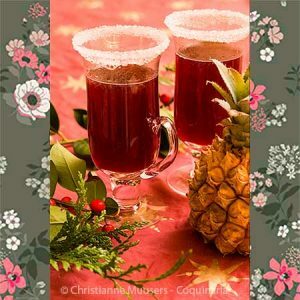 There are many recipes for stock on Coquinaria, like this one for lamb stock, and a seventeenth-century meat stock. Main course for 8 to 12 persons; preparation in advance 30 minutes; preparation 60 minutes. Pastry shell – Cut a round sheet of dough that fits exactly on the bottom of a springform. Then cut a strip of dough, as wide as the sides of the springform are high. Butter the springform, line it with the sheets of pastry dough. Save some dough for the cover and decorations. Stuffing – Make the stuffing by mixing everything well together. The stuffing should be slightly creamy/moist. Strain the soaking liquid of the mushrooms through a coffee filter. (Before soaking the morels, rinse them thoroughly. Then soak them first for five minutes in hot water, throw this water away, take fresh hot water to let them soak for at least an hour. This second soaking water will be used for the sauce). Pat the morels thoroughly dry after soaking. Lamb chops – When using a large springform you can leave the ribs on, but when you use a smaller one, it is best to chop off the ribs from the lamb chops. Flatten the lamb chops with the flat side of a heavy cleaver. Mix the ingredients for the breading. Coat the lamb chops with the breading, and fry them in butter until they are a golden brown. Let the chops cool and drain on kitchen paper. Sauce – Fry the shallots in butter or the drippings of the lamb chops. Prepare a roux using butter or dripping and flour, and meat broth or the strained soaking liquid of the mushrooms. Finish it off with spices and lemon juice to taste. Preheat the oven to 190 °C/375 °F. Lay the stuffing on the bottom of the pastry shell. Press the lamb chops slightly in the stuffing, sprinkel the morels on top. Cover the pie with a round sheet of dough. Make sure the sides of cover and sides are pressed well together. If you want to you can decorate the cover with the remaining dough. If you want to, you can make a hole in the centre of the cover (a chimney), to allow steam to escape. Place the pie in the oven, the second rack from the bottom (below the middle of the oven). Bake during 50 minutes. When the pie is done, take it out of the oven, and let it rest for at least five minutes before removing it from the baking form. The cover of the pie was cut loose from the shell. This indicates how such pies were being eaten: the stuffing is scooped out of the shell, just as if it were a serving dish. If you want to, you can always eat the shell afterwards. The cover was cut in wedges. The wedges were stuck along the shell, to form a decorative crown. When the cover is not hard enough because of the meat juices, just put it back in the oven after cutting it loose for another ten minutes, to let it dry before cutting in wedges. Reheat the sauce. According to the original recipe, it should be poured over the stuffing in the pie. You can serve it like that, but you can also serve it in a sauce boat, to allow every one to take or leave the sauce. Per portion you take one or two lamb chops and some of the stuffing. Then pour some of the sauce over. 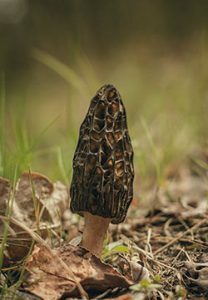 Mushrooms are often associated with Autumn, but the Morel (Morchella esculenta and other varieties) is a Spring mushroom (April-May). It prefers to grow on places in fields or woodland where there has been a fire. In the Netherlands it also grows in the dunes. The caps look a little like sponges. Uncooked morels are poisonous; they have to be boiled for at least fifteen minutes and the first cooking water has to be thrown away. However, dried morels are harmless, and the soaking water can also be used without problems. Dried morels are available all year, and just like all dried mushrooms they have a stronger flavour than when they are fresh. On the other hand, fresh morels are excellent when stuffed. Warning: False morels like Gyromitra esculenta are very poisonous. Always check the source of your mushrooms, and buy from reliable retainers. Joop Witteveen, ‘Kookboeken over kookgerei. Het kookgerei van de middeleeuwen tot de twintigste eeuw’. (‘Cookbooks on cooking gear. Cooking gear from the Middle Ages to the 20th century’) In: Quintessens. Wetenswaardigheden over acht eeuwen kookgerei. Rotterdam, 1992, pp. 14/32. This festive pie from 1797 contains chopped veal, lamb chops and morels, and is served with a sauce.